If you aren't a pack rat yourself, you likely know one. This page contains organizing tips for a pack rat. This is an organizing tip from a reforming pack rat that will also save you lots of money. It is a fun challenging idea. We love it! Use a large plastic container to store all of your receipts for purchases made within the last 3 months or more, for example clothing store and grocery and home depot, Walmart and other store receipts. 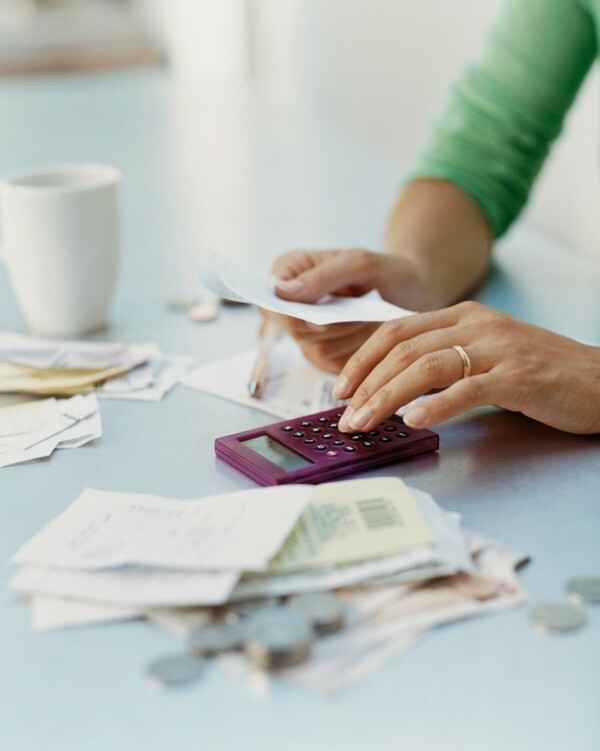 Keep it in a easily accessible location, so you can develop the habit of emptying your receipts when you come in. Pick a closet or dresser to clean out. Recently I found $75.00 worth of clothing from the same store that I had never worn, purchased in August. Here it is January! I put all of the clothing with receipts in a storage container with a lid, and just checked it if I was running errands (paying bills) and knew I'd be near one of those stores. I saw a skirt that I loved and asked when it would be marked down. Turns out, it was the following week. I traded it in and got a gorgeous denim skirt, which I wear and cost the full amount of my original purchase. If by chance, you don't have your receipt, most stores will give you credit at the current cost of that item. Having your receipt makes it easier to prove what you spent and less stressful. What a wonderful reward for my efforts, cleaning and decluttering! This even works with buying books. I have a ton of them at home, half I have read the others I got from yard sales. There is a wonderful trade in program at a second hand Bookstore in a nearby town. I took in enough books to have credit built up of $50.00. I kept a list of books I wanted to get and kept it in my purse. The next time I wanted to get some books, it cost me nothing but the time it took to clean off the shelves at home. Not only did this improve the Feng (how do you say) Shui, giving us less clutter. It also helped us stick to our commitment not to purchase impulsively. I could go on forever with ways that we have saved by adopting this clean and trade policy in our household. Lastly, I wanted to paint the kitchen and we all know that can be costly. I took three different colored paints and mixed them to get the desired color I wanted (Salmon). Warning do not do this without first calling the paint dept of your local paint store or Home Depot. Or you might be forced to spend money to fix the error. After calling HD, I opened three cans of paint and began to slowly mix them with the off white that I had. These paints had been in the closet for months! My kitchen looks so cute! And it cost me all of $15.00 (spent last year) to paint. I used to shop in the Oops section of the paint department. Now those cans of Oops have turned my kitchen to FAB! Not only did organizing the paint closet help me realize I had enough supplies to paint the entire house, it helped to create one great color out of three not so great. Think collecting receipts does not pay? We recently realized we have $1,000.00 in merchandise from Costco that we never used, from our wedding. Look out Costco, here we come! Do you have any tips for helping a pack rat organize and get rid of their stuff? Feel free to post them below. If you have not yet seen the show on TLC called "Clean Sweep", you should! I came from a long line of relatives that hung on to everything for whatever reasons. This show has really opened my eyes to what you should or should not keep and when. I have watched high school/college cheerleaders and football players give up uniforms, helmets, trophies, etc., even heirloom items. If you never use it, let someone else have it or sell it. If you don't have it already displayed in your home and don't intend to, get rid of it. When you have a yard sale, check on eBay for what the items are selling for and use that as a guide. Chances are, whatever is in your home you can cut in half by 50% (books, music tapes or cd's, toys, clothes, etc.). I know that this sounds simplistic but if you are a pack rat (and who isn't? ), try to root through your things on a regular basis. I put away items into a "safe" place and then I cannot find them. I am in a store and I "think" I need pens when I have dozens of them, if I only knew where. I decided several years ago not to keep everything "just in case". I know several people I can call if I need something I do not save, like oleo tubs, coffee cans, or even bits of fabric. Why not let them save the extra things so I can stay organized? I have a pack-rat spouse! He never wants to toss anything. I have been secretly tossing things and they are NEVER missed. But how do I toss old TV's, phones, clothes that will never fit his body again, ect? One thing you might try is creating an area where you put stuff that is going to be thrown out. 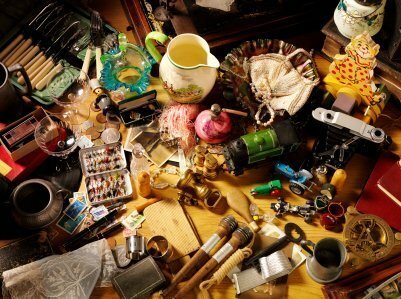 You might collect old clothes, papers, appliances, etc. in one area of the garage or basement. Then, periodically purge everything in that area. This will help get over the fear that something which is actually important will be lost. Hi Grandma Eve, Love that man and his pack rat trait! IF that is the only thing that is an "issue" you have a jewel of a man! Cherish him and ALL the "stuff" that comes with him. Join a freecycle organisation. You should be able to find one near you if you do a google search. I belong to one and it's great. People pick up all sorts of things off you, and you may be able to pick up things they dont' need as well, which you do. Tell him it's going to a good home, and not to a landfill. How about telling him you are donating them (if they are in good enough shape) to charity. People who have lost everything to Katrina, Rita, and the mudslides worldwide can benefit. You never realise how much you truly have until you have met someone who has lost everything. If your items are not in good enough shape to be donated, then tell him that keeping them is inviting bacteria, pests, including mice, roaches, among other icky things... If either of you have breathing problems, allergies, and troubles sleeping at night, I would be surprised if the clutter did not have at least something to do with it. If his stuff is in more than one room in the house, maybe you could choose a room that he is in daily and clean it out. (when he is not home, of course!) But dont get rid of the things he will notice missing. Box them up and put in the garage or somewhere. When he notices the clean room, it might inspire him to want to get rid of some of that stuff. Check out www.flylady.net She has great ideas for SLOWLY eliminating clutter and she says that if you hold onto things you don't use or need, you are holding back a blessing from someone who needs those things. GOOD LUCK!!! If he is saving things, it's because he thinks he will need them again. Can you figure out a way to show him that it's more expensive storing all this stuff than buying it again? Also, stored items lose their freshness. Plastics deteriorate, crack discolor, etc...cloth develops spots. Try donating all of his "good stuff" to your local thrift shop, or to a local shelter.. Freecycle.org is also a great place to get rid of unwanted items. My mom and grandma put everything (I mean everything extra!!) in a spare room. Each time my mom went over, she told my grandma so and so needed something. My mom then took the items to the thrift store (without grandma). This way, my grandma felt like she was helping so and so, her house was being cleaned out and other people got a bargin. My cousin didn't like it b/c so and so really didn't need it...I felt that oh well b/c my grandma's mental health (and non beyond fire trap of a house) felt great!! And in reality, we that go to thrift stores do need it!! I am troubled by the attitudes I find on many of these feedbacks. My husband and I live in a house. It is not MY house. It is not HIS house. It is OUR house. Many of the items in this house belong to both of us. There are also items here that belong to HIM. There are items here that are MINE. There is this thing called RESPECT. If I choose to dispose of something that is his..........that is DISRESPECT! My husband and I are friends, partners and equals. Neither one of us "is the boss of this house"! We share the decisions about everything. We could both be described as pack rats, although my case of it is more severe than his. Every few months we look at each other and laugh and say"We need to thin out this mess" and we do it. He thins out his, I thin out mine. We take stuff to Habitat for Humanity and the Salvation Army and rearrange our remaining "stuff". I wouldn't dream of disposing of anything he was keeping. That would be so insulting and unloving! We both know that we can just "be" in our own home. He can sit on any piece of furniture he chooses to, set his glass of iced tea on any table in this house.....and just "be". I do understand that some people take the pack rat syndrome too far and it becomes a safety and comfort issue. I think you need to deal with them kindly and firmly. Tell them some of this has to go. Say "You choose what you can give up, I'll put it in the car/truck and take it where you like, or I'll even choose where to take it if it's difficult for you to choose." Many will be relieved to have someone help them, they just need to have control over the selection process. I helped my mother-in-law this way and it worked. I handled most of the items while she sat in a comfortable chair. I'd show her an item and ask donate, keep or pitch? She'd make a decision and I'd move on to the next item. At the end of the day I'd haul the pitched items to our dumpster, take the "donate" to the appropriate charity and return the kept items to the "junk room" we were working on. Eventually we worked it down to an acceptable level. The neat thing about it was that the more area we got cleaned out, the more eager and willing she was to let go of things. I believe as folks get older it just takes so much of their energy and effort that they are reluctant to start on the elimination process. It just overwhelms them so they do nothing, and the "monster" just grows. I could be wrong ( I know I've been before :>) ! )....but it appears that most of these complaints are coming from the ladies who are so caught up in having the "perfect" house to show off to neighbors, friends and the magazine salesman! In the final accounting of your life.........will you be proud and glad that strangers could say "her house was always neat as a pin"..... but your husband and children will say "well, I could do or have almost anything.....as long as I was in the barn or garage, the house was off-limits". The house I live in is a "home". It is not fashionably decorated. It is rarely "spotlessly clean". It is filled with many things, mainly peace, contentment and joy. The rooms are overflowing with happy memories and we make more every day.